Everyone is creative in their own way. God has created each of us with different gifts and talents to be used to reflect His goodness and His image. Creativity is not constrained within the arts, it is included in the processes of thinking, planning, and decision making. Sometimes, we need to remove distractions and shift our perspective so that we can find the creativity that God designed us to enjoy. At our last MOPS meeting, my creative Co-Coordinator came up with this amazing activity to help us “notice goodness,” “embrace rest,” and to “celebrate lavishly.” We started our meeting by watching an engaging speaker, Kay Morison, talk about the importance of finding our creativity and embrace it as a way to recharge so we can continue to pour into others. She made a point to say that creativity looks differently in all of our lives and it can be found in things like spreadsheets and in runner’s strides. After viewing the video, each mom was given a “Noticing Goodness Kit.” The kit contained cardstock, numbers, mat, a heart, and writing prompts. We organized the items on our paper, glued them in place, and waited for the next instruction. My Co-Coordinator asked us to think about the many things we love and then led us through two or three examples, encouraging us to be creative in how we numbered and wrote the items on our paper. Once we all had a good idea of what we were to do, she sent us off to find a peaceful, quiet space. Then we were left alone with our thoughts, a pen and our paper. When you are a mom of little ones, you rarely get 30-40 minutes of alone time without interruptions. The time to think was a gift in itself. It took me three or four tries to find a comfortable, quiet spot. Once I found a space, I did nothing but sat and breathed. The silence was unfamiliar. A good five minutes went by before I pulled out the prompts and things started coming to mind. Sometimes, they came quickly. Word after word. A few times, I got stuck and sat in silence again. I found that there was no particular order of importance and one word/memory often led to many other things that I loved. Before I knew it I had 100 items on my paper. I could have kept going. I reread my list and realized that I had missed things that I absolutely love- chocolate-chip cookies, apple picking, Santa Claus, running, the 4th of July. I also realized that I missed many memories- Story Land with my family, going to Cape Cod, my wedding, soda floats in chemistry beakers with my grandpa, and watching Days of Our Lives with my aunt. It did not matter what I missed or how many things I forgot. This was not a checklist-type of activity. No bonus points for the best or most unique item. This was practice in opening our eyes to notice the goodness in the every day, in the smallest moments, with the people who you do life with. It was also helped us embrace rest and to celebrate lavishly in what we accomplished. If you do get a chance to do this activity, I would love to hear your thoughts and how you did. This entry was posted in EMBRACE Creativity and tagged 100 Things I love, Celebrate Lavishly, creativity, Embrace and Celebrate Life's Moments, embrace rest, Journaling, MOPS, MOPS Meeting, noticing goodness. Bookmark the permalink. Love this idea, Shanna! 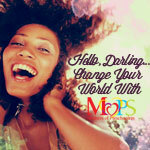 You should post this on the MOPS ideas page! Reblogged this on Make it in the Margins.